NOTE: I do not necessarily agree with, nor is the following quote an endorsement of the organization from which it came. I do however agree with the quote. In my search for a clear definition of Christianity, I came across the above quote. The web site claims that there is no consensus on the correct definition of the word, "Christian". I hate to say it, but I have to agree. Different groups define what a Christian is based on their own ideas rather than on a particular standard. So I continued my search until I found a definition that fits what I believe. If this definition is not the standard, it should be. Ro 3:30, 1 Cor 8:6, Eph 4:6, 1 Ti 2:5, Ja 2:19. MT 28:18-20, MT 4:19, 8:22, 9:9, 10:38, 16:24,19:21, John 10:27, 12:26, 21:19, 21:22. 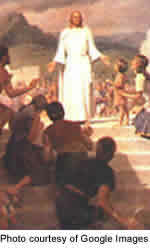 Third, while there are many other sources of information about the life and message of Jesus, the four canonical gospels of the New Testament are the main sources of information for the doctrinal Christian narrative of Jesus' life,(wikipedia.org), and it is the only reference that claims to be divinely inspired (2 Ti 3:16). If religions claim to be Christian, at minimum they should agree to the above definition. They should believe in One God, they should follow the teachings of Jesus of Nazareth and most importantly, they should center their beliefs on the life and teachings of Jesus of Nazareth as presented in the New Testament. Christianity is exclusive. If that sounds narrow minded, well I guess it is. It is exclusive in that only those who adhere to the definition of what a Christian is, can they really be considered Christians. I can claim to be a brain surgeon all I want, but what have I done to be qualified to make that claim? If I don't meet the requirements of what it takes to be a brain surgeon yet make the claim, I'm delusional. Christianity is the same way. There are many people that claim to be Christians, but unless they meet the requirements of true Christianity, they are just fooling themselves. Someone reading this might say that my definition of what a Christian is, is arbitrary, therefore I might be fooling myself. Fair enough. But I have found a definition which is easy to understand, it is logical and there is no doubt about the source of my faith. I don't have to go searching through a myriad of sources to answer the questions of my faith. I can look to One God, One Jesus of Nazareth as presented in the New Testament and I don't have to defend its authenticity before I can believe what it says. Christianity is not as difficult as some people have made it out to be. Christianity is as simple as the definition above. Stay with me and you'll see what I mean. The name [Christian] given by the Greeks or Romans, probably in reproach, to the followers of Jesus. It was first used at Antioch. The names by which the disciples were known among themselves were "brethren," "the faithful," "elect," "saints," "believers." But as distinguishing them from the multitude without, the name "Christian" came into use, and was universally accepted. This name occurs but three times in the New Testament (Acts 11:26; 26:28; 1 Peter 4:16). Encarta Encyclopedia 1999. Above is the technical definition of Christian, now allow me to tell you my definition. A Christian is a person that follows and practices the teachings of Jesus of Nazareth as presented in the New Testament. The Bible is a relatively small collection of books. The second part of the Bible, the New Testament, is even smaller than the first part. It should be a simple matter to master the Bible, much less the New Testament. So what is the problem? The problem is that people have made Christianity so difficult by introducing things in their churches that they have no business introducing, with all of their requirements for membership, their man made philosophies, their greed laced gospels and programs to keep you busy the rest of your life. They have forgotten the simplicity that is Christianity and have placed burdens on their members. Remember, Jesus said he will take away our burdens and make us free. Modern churches seem to have done just the opposite. Continue on with me now to real Christianity. If you are not a Christian, and would like to begin your journey to eternal salvation, please choose the link below, The Simplicity that is Christianity first. If you are a new Christian, or would just like a refresher, please begin with the basics, Christianity 101. If you are a seasoned Christian and desire more mature material, then by all means move along to Moving On To Maturity. Unsure about Jesus? Visit Y-Jesus.com for everything you ever wanted to know about Jesus but was afraid to ask. Christianity 101 - Get an overview of the basic concepts of Christianity. This is an excellent, easy to navigate and easy to understand web site that will help you learn basic Christianity. While you learn the basics, please return here for more detailed instructions on Daily Christian living. Daily Christian Living - Instructions on how Christians ought to live. Y-Jesus.com - Y-Jesus attempts to present the evidence for Jesus' identity with an even-handed approach. Who did Jesus really claim to be? Is the resurrection merely a Sunday school story without evidence? Has the New Testament account of Jesus been rewritten by conspirators?